Looking for cheap hotels to stay in? If you are going to any of the following places: Mandaluyong, Otis-Manila, Bacolod, Dumaguete, Puerto Princesa, and Tacloban, then check out Go Hotels. They offer one of the cheapest rates with a decent service. And if you plan to stay sometime between June 1 to August 31, 2013, then you can avail of extra discounts if you book now. Because Go Hotels has just announced their latest promo cutting down their room rates to as low as 588 Pesos (exclusive of VAT). That includes the bed, Aircon, cable TV, WiFi, Room Safe, Towels, Soap and Shampoo. 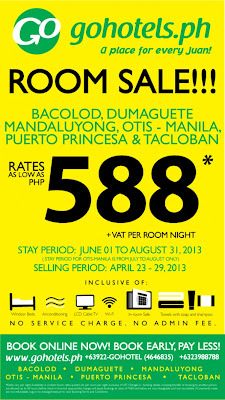 You can book your rooms at www.gohotels.com.ph or at any branch. 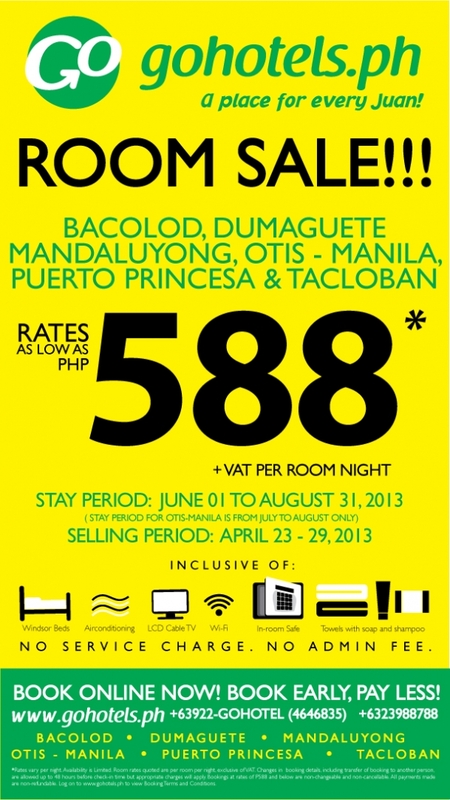 The promo is valid until March 29, 2013 but subject to room availability. Go Hotels is a budget hotel chain operated by Robinsons Land Corporation (rlc), the property arm of John Gokongwei Summit Inc (JGS). JGS also owns Cebu Pacific, the largest airline in the country. Other hotel chains that operate similar to Go Hotels includes Islands Stay Hotels and AirAsia's Tune Hotel. Do you want to receive free notifications from www.promophilippines.com regarding promo fares, hotel sales, and other promotional activities? If you do, try any of the following.